Among the 10 artifacts listed as National Treasures (CLICK HERE) and displayed at the Singapore National Museum is the intriguing Singapore Stone with its links to the Sejarah Melayu. As with the successful effort to have the 1535 Sejarah Melayu or Malay Annals (CLICK HERE) translated from Classical Malay in Jawi script to English, and the excavation of the Borobudur in Central Java (CLICK HERE) in Indonesia, the largest Buddhist monument in the world, the discovery of the Singapore Stone owes much to Sir Stamford Raffles, recognised as the British founder of modern Singapore (in 1819). Of course, the Sejarah Melayu is the first to mention the name Temasik as the old name for Singapore, and credits its founding somewhere between 1000-1300 CE to Sri Tri Buana/Sang Nila Utama, one of three Indian princes who landed in Palembang in Sumatra, Indonesia. This again is linked in some way to the 10th century CE Chola (South India) invasion of South East Asia (CLICK HERE). It is also important to understand that prior to Raffles' annexation of Singapore, it was owned by the Johor Sultanate of Peninsular Malaya. 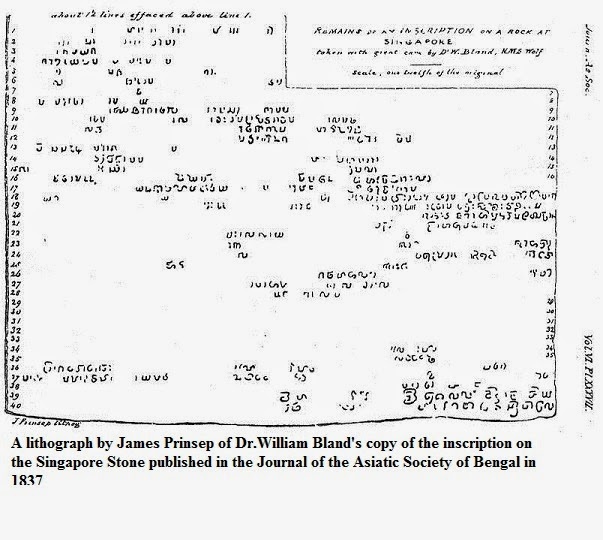 Soon after Raffles arrived in Singapore in 1819, efforts were undertaken to widen the mouth of the Singapore River, when Bengali workers discovered a 10ft by 10 ft sandstone slab bearing inscriptions which till today have not been deciphered. Experts reckon the script used is Sanskrit, Tamil or a mix of those with Jawi. Professor John Miksic of National University of Singapore, who carried out a remarkable excavation at Fort Canninig (Bukit Larangan or Forbidden Hill) and its Keramat Iskandar (Alexander) (CLICK HERE), is quoted as saying that these inscriptions will never be deciphered, though this sound a little strange when you consider that the secrets of the Rosetta Stone and the Dead Sea Scrolls have all been laid bare through inspirational endeavors. Inexplicably, the Singapore Stone was blasted to pieces by a British philistine, and it was only through the efforts of the likes of Raffles, James Prinsep and James Low, translator of the Kedah Annals (CLICK HERE) and discoverer of Bujang Valley in Kedah (CLICK HERE) that pieces of the stone were retrieved for study. Some pieces were sent to the Calcutta Museum where they presumably lie dormant till today! 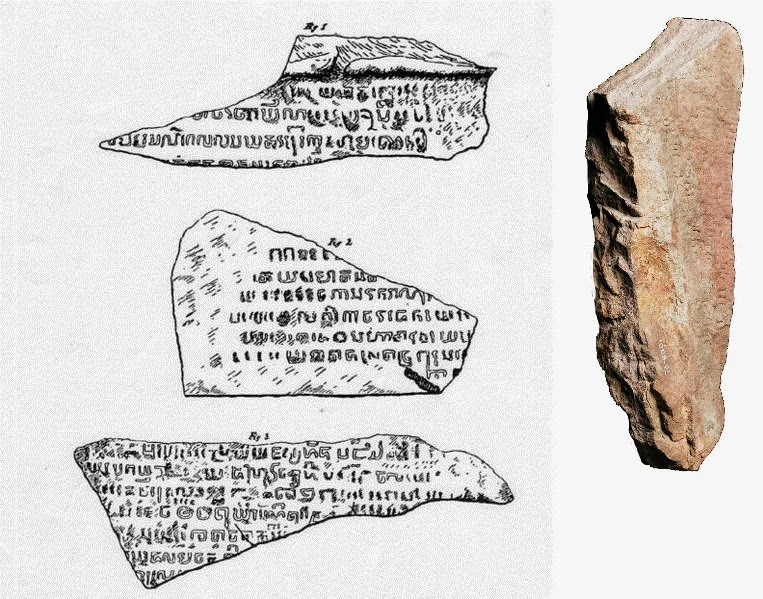 What is the link between the Singapore Stone and the Sejarah Melayu? "Here now is the story of Adirama Raja Mudaliar, a son of Raja Chulan (Cholan). He was Raja at Bija Nagara (Vijayanagar) and had a son named Jambuga Raja Mudaliar.....who had a daughter, Princess Talai Puchudi." The Raja of Keling (Kalinga/India) agrees to a proposal from the ruler of Singapore, Paduka Sri Pikrama Wira, for his son, Sri Rana Wikerma, to marry Talai Puchudi. The wedding takes place in Singapore. "Now King Sri Rana Wikerma had a war chief, called Badang, who was possessed of very great strength. Badang originally came from Sayong on the mainland (Johor? )....Later the news reached Kalinga that the Raja of Singapura had a war chief possessed of prodigious strength. Now the Raja of Kalinga had among his champions an enormously powerful man, and.....commanded this man should go to Singapura with seven ships.....to pit.....in a trial of strength against the war chief of Singapura. If he defeats you, you will pay to him as the stakes of the match the contents of the seven ships. But if you defeat him. you will demand the value of the good in the seven ships. In every encounter between them the Kalinga champion was worsted by Badang. Now in the front of the hall of audience there was a huge rock..thereupon the Kalinga champion tried to lift the rock and failed.....Badang lifted the rock.....and hurled it to the far bank of Kuala Singapura. That is the rock which is there to this day on the extremity of Tanjong Singapura. ...And after a while Badang died and was buried at Buru. When news of his death reached Kalinga, the Raja of Kalinga sent a stone for his grave, and that is the stone which is there to this day." Astonishing is it not? An episode in the Sejarah Melayu, which even many Malay historians dismiss as a hotch-potch of fables and legends, gives you an exact link to the Singapore Stone, which is no figment of anyone's imagination. The Singapore Stone is either the marker of Badang's grave or a recognition of his prodigious feats. Of course, Badang did not merely hurl a huge rock for a place in history. The likely scenario is that the Badang story and the Singapore Stone commemorate a great victory by the Indian/Hindu King of Singapore who had brilliant generals like Badang assisting him in defeating an invasion by some King from South India (Kalinga). The Indian ancestry is irrefutable as the Sejarah tells us in no unclear language that the daughter of the Indian King married the son of the Indian ruler of Singapore. All have Tamil names - Talai Puchudi translates from Tamil as Head of Flowers. We must subject the legends in the Sejarah Melayu to tests of reason and logic, to unravel the truth behind them. As for deciphering the Singapore Stone, I am sure that collaboration among experts from Singapore, Indonesia, Malaysia and India should produce positive results. If that does not work, we'll have to shout for help from the West! I miss this interesting article. Going by the great monuments left behind by the early kingdoms, we have no doubt that the Indians have had a great influence over the South East Asian region from early times. I have only been dropping by once in a while to get inspiration from one of your side wall pictures. Cheers. Adam.